You may have a penchant for taking up DIY projects, but tree removal shouldn’t be one of them. According to the tree care pros at Owens Bros. Tree Service, the risks involved in cutting trees are too significant to be taken casually. For over 50 years, the Bronx, NY, company has provided a wide range of tree services to clients in and around the area. They emphasize hiring professionals to remove your trees, guaranteeing a safe and sound process. It Requires Thorough Training: While tree removal experts perform the procedure perfectly smoothly, the reality is that this task takes extensive training. Properly trained tree cutters are equipped with a keen attention to detail, which helps them in assessing the situation and proceeding accordingly. Considering that tree removal is a specialized field that necessitates expertise, it’s better to get the job done right the first time by hiring qualified specialists. It’s Dangerous: If not handled the right way, removing trees can cause serious injuries to you and others. Moreover, falling branches and debris can result in considerable damage to your property. 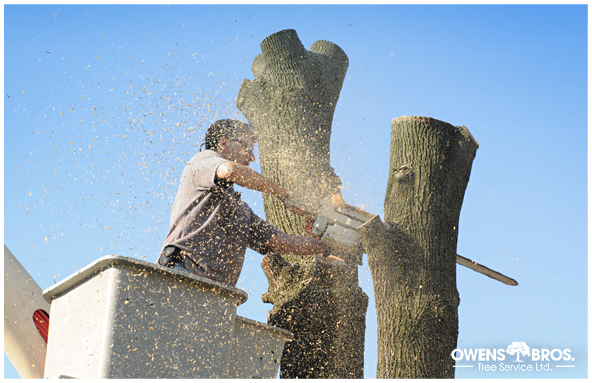 Why take the risk when you can entrust this hazardous task to the experienced team at Owens Bros. Tree Service? Thanks to their unrivaled knowledge in the field, they guarantee completely safe and secure removal of trees from your premises. You Have The Liability: When taking up the responsibility on your shoulders, you’re also liable for any costs that are incurred due to damages. To save yourself from this unpleasant scenario, choose a fully insured company like Owens Bros. Tree Service for tree removal services. Covering you for any on-site mishaps, they give you reassurance that your tree removal assignment will be handled with utmost efficiency. With Owens Bros. Tree Service at the helm, you know your tree removal project is in the most trusted hands. Committed to offering comprehensive tree care solutions, they help maintain your trees in their lush, green glory. For further details about their tree services, call the helpful staff at (718) 885-0914, or visit their website.